Proper video editing in Final Cut Pro requires customization of the software itself. Though video editing is technical in some sense, it is really more of a creative workflow. In this way the tools, which in this situation is the software, must be pliable enough so that you can set it according to your needs and that way you can help usher in a more intuitive workflow. Final Cut Pro does this in its User Preferences, which are settings that are specific to how the user wants Final Cut Pro to work. Here is a Final Cut Pro tutorial on how to work with the User Preferences, what is included, and what should be altered. Begin by selecting Final Cut Pro in the upper right hand corner, which gives you a series of settings options. Go ahead and choose User Preferences, which is right above System Preferences. In this window you are going to have a series of options, each on their own tab. The first tab will be General and will be a lot of binary decisions such as to stop video capture in the case of dropped frames, whether or not to open up the last project when you open up Final Cut Pro, how many undos you want to allow, autorender time, information about the autosave vault, and other decisions. These really can be altered according to how you feel about it, but try to not overdo things like how often the autosave occurs and how many redos you allow as these could slow down your computer. Try to take some time and think about each one and you may keep many of the settings as they are just extra secure options for maintaining quality, such as the aborting of a video capture with dropped frames. Under the Editing tab you are going to find specifics for editing settings, such as the automatic time assigned to a clip from a freeze frame, different types of warnings such as when something is being sent to Soundtrack Pro, and other features. These are more complicated in the General tab so you should make sure that they specifically apply to your project before going for them. The Labeling tab refers to the color that things can be labeled and really should not be altered. This is a common language among people using Final Cut Pro and there is no reason why you should be altering this as it could only make things more confusing. want the thumbnails to appear in the blocks on the tracks, what you want the audio tracks named, how many standard audio tracks there are to a video one, and so on. These are not usually very crucial to the actual productivity of the work and instead useful only as they assist you in your work. Render Control, on the other hand, may be much more important to look at. 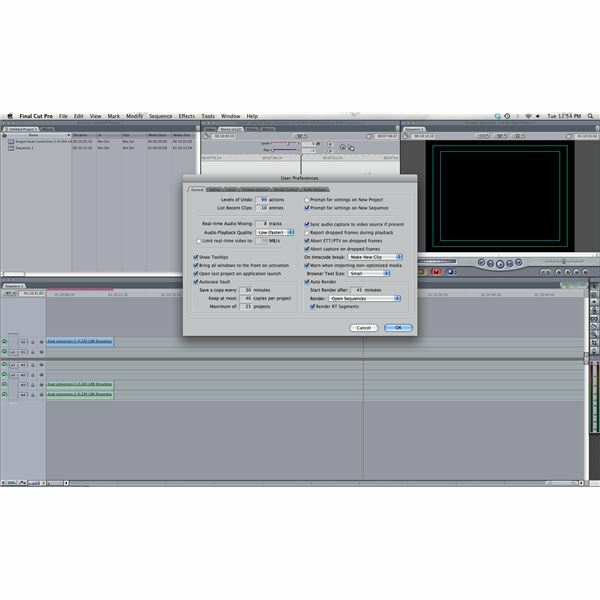 This part of the Final Cut Pro User Preferences focuses in on the rendering of video and audio, which is important for playback and exporting. Here you can change how matched the frame rate and resolution are to the original clip, if the codecs remain the same, and the quality for Master Templates and Motion Projects. This can be useful to downgrade if you are having trouble running your project. The last Final Cut Pro User Preferences option is for Audio Output and is where you select how the audio comes out. This is a more complicated feature and should be ignored by most casual users unless you really have relevant facilities to change it for. Here are some tutorials on how to use the Final Cut Pro software as a whole.